There are a number of times when it is useful to have a truck, but there are also times when you don’t want a big bulky vehicle to take everywhere. Enter, the midsize pickup. This one is perfect for a number of jobs including towing and hauling, but it also contains a wide variety of features to make it a worthwhile purchase. For drivers everywhere, there are a number of options available and it is easy to understand why drivers would opt for a midsize pickup truck rather than a big, bulky SUV or a compact sedan. Sure, there are other vehicles out there that are potentially more powerful and heavy-duty, but they don’t have the handling and efficiency that the 2015 Toyota Tacoma Brampton ON does. You can see all of the colors and trim levels today in our online inventory! Just click the button below! The 2015 Tacoma comes standard with a 2.7L engine that makes up to 159 horsepower and gets up to 11.5L/100KM in the city and 9.5L/100KM on the highway. It can fit up to four, which is just enough to keep its awesome efficiency ratings, but still has room for your family. It’s impressive towing capacity of more than 1,500 KG makes it easy to get anything done. It has a maximum payload of 475 KG. The cargo bed is 1,866 mm, 1,054 mm wide and 457 mm deep. 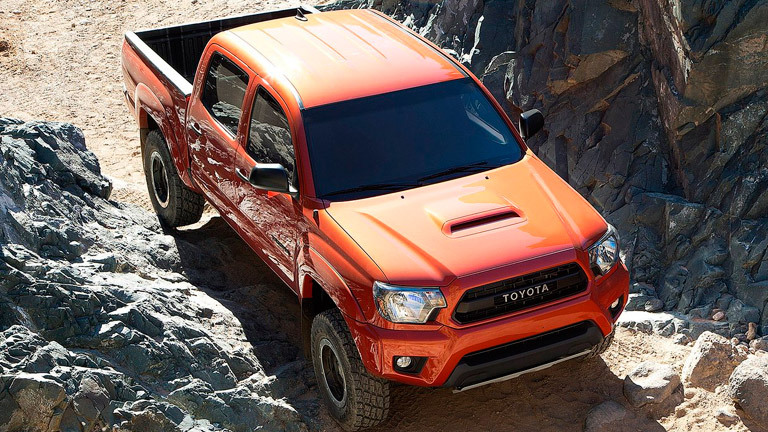 The 2015 Tacoma is stylish, sleek and easy to handle. Most drivers feel completely comfortable transitioning from driving a sedan to the Tacoma because the two vehicles are very similar in terms of handling and efficiency. Drivers can choose between 4X2 or 4X4 drive, which makes it easy to get the perfect truck for your needs. Speaking of needs, the 2015 Tacoma comes with a lot more than just the bare bones in its standard model and trim. The 2015 Tacoma is capable of going anywhere. Its athletic, strong physique makes it a fun vehicle to drive. Some of the other fun features that come with the 2015 Toyota Tacoma include a fun, high-tech display screen with a 6-speaker audio system and vehicle information. There is rear seat storage in addition to the truck bed so there is no shortage of places to store stuff. 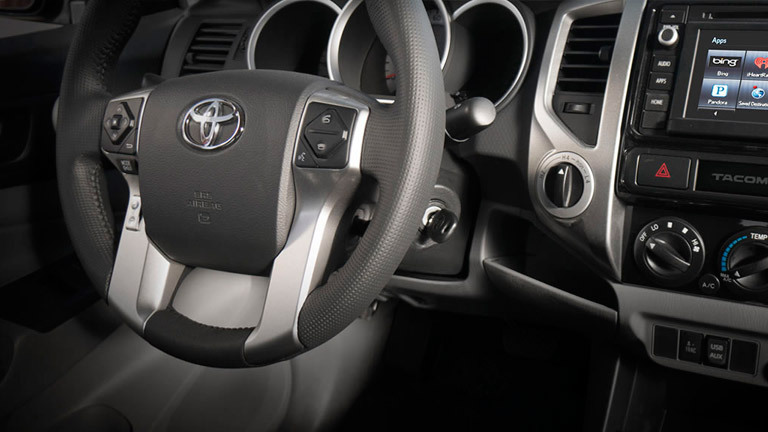 The steering wheel-mounted controls allow drivers to keep their eyes on the road at all times. Some of the safety features that are noteworthy include traction control, vehicle stability control, electronic brakeforce distribution and smart-stop technology. Set up a test drive today at Attrell Toyota.